It is peaceful outside as I write. 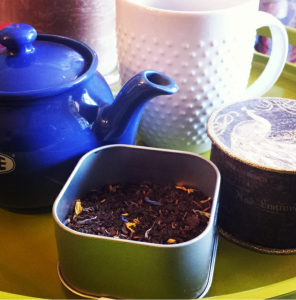 It’s Monday and I am sitting here sipping a cup of Mate Chocolate tea. The tea is a nice change from the daily coffee. Most days, I think about how to live a balanced life. 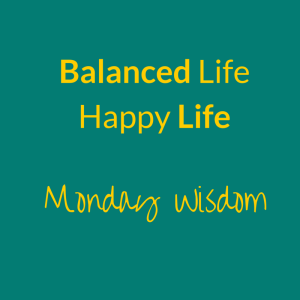 As I was thinking of my topic for today’s Monday Wisdom, I chuckled as I remembered how imbalance recently affected me. A couple of weeks ago, I had a dull, persistent discomfort in my left shoulder blade – the kind that you think a deep tissue massage to work out. I tried rolling it out on the foam roller and soaking in a steaming hot Epsom salt bath but neither worked. Ibuprofen failed me. In less than 24 hours, I was about to take the dog, hop into the car, and drive 4 ½ miles north to my nephew’s graduation. I couldn’t drive with this discomfort. I ran to the health food store near my home and spoke with the guy who manages the supplement department hoping he could help me find a holistic solution. The man is a retired doctor and he knows his stuff. He asked me a few questions like what I had been doing prior to the appearance of the pain. I told him that I had been writing a lot on the computer. He asked me how I sit as I am working on the computer and I explained that I always sit with my left leg bent on the seat cushion so that I am resting most of my weight on the left side. I mentioned that I had been at the computer for most of the day. He looked at me curiously, smiled and said that I was keeping my body out of balance. I laughed at the sound of the word balance. I mean I write about this topic. How did I miss this? He reminded me that the solution was to switch the legs and rest my body on the opposite leg so that each side had equal time. When your body is out of equilibrium, pain appears in various areas. Additionally, I had been hunched over writing and stressing about the upcoming trip. I needed to counterbalance the sitting and worry with an activity that would balance my body and distress my mind such as walking or yoga. Everything in life needs a counter action. When fitness professionals are in the gym, they know they need work out opposing muscles. Imagine if they only worked out their quads but not their hamstrings, their chest but not their back, or their biceps but not their triceps. When I returned from the health food store with nothing but a pain patch in the event I needed to numb the area during the drive, I began to perform stretching exercises to stretch out the right hip. Wouldn’t you know that the next day, the discomfort went away? Next time you feel pain in your body, think about the position you’ve been sitting in, what exercises you have been doing, and what you have been thinking and do the opposite. If you’ve been focusing your thoughts on a negative outcome, change that thought into a positive statement. Do a back stretch to open up your chest if you have been hunched over the computer. Get out your mat and practice yoga or a stretching session if you have been doing a grueling exercise routine. If you perform solitary activities, get out and socialize more. Remember, everything in life requires balance so you can live your best life.